Explanation: This bright cosmic cloud was sculpted by stellar winds and radiation from the hot young stars of open cluster NGC 3324. With dust clouds in silhouette against its glowing atomic gas, the pocket-shaped star-forming region actually spans about 35 light-years. It lies some 7,500 light-years away toward the nebula rich southern constellation Carina. A composite of narrowband image data, the telescopic view captures the characteristic emission from ionized sulfur, hydrogen, and oxygen atoms mapped to red, green, and blue hues in the popular Hubble Palette. For some, the celestial landscape of bright ridges of emission bordered by cool, obscuring dust along the right side create a recognizable face in profile. 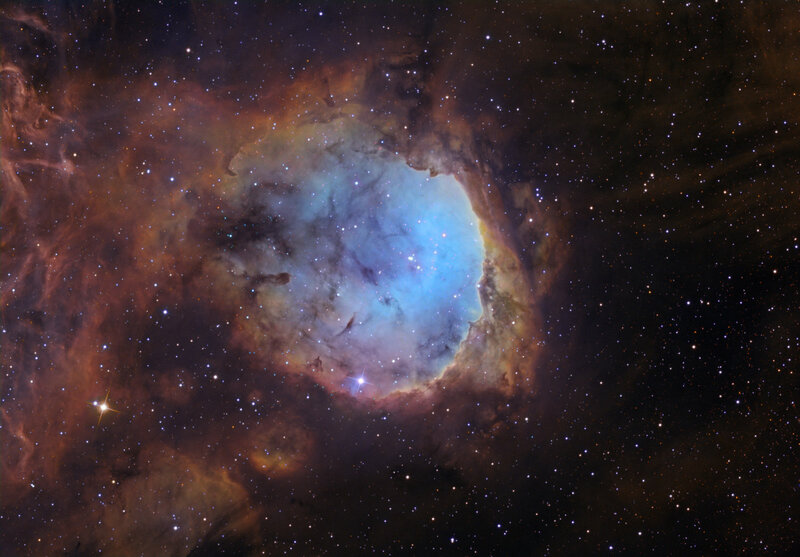 The region's popular name is the Gabriela Mistral Nebula for the Nobel Prize winning Chilean poet.